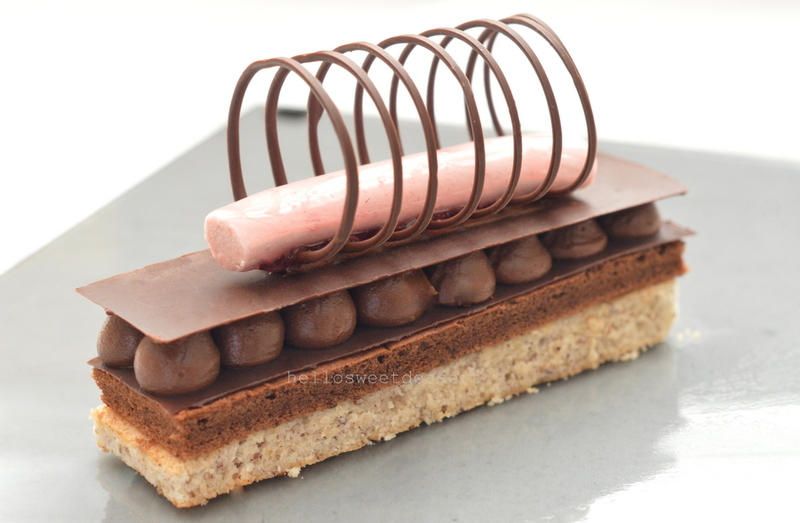 This dessert although seem familiar, it is an absolute challenging task for me when lack of proper equipment. The chocolate task definitely is the time consuming work.That has taken me days to complete and practice due to insufficient acetate sheets. (I have to pipe one,set in freezer, peel off from acetate sheet and repeat this for 5 more).Acetate sheets, it is not easy to find in Sydney. Everytime I go back to Malaysia, that is the only way I can top up my baking material. Acetate sheets become one of my essentials that I need to use it thrifly. 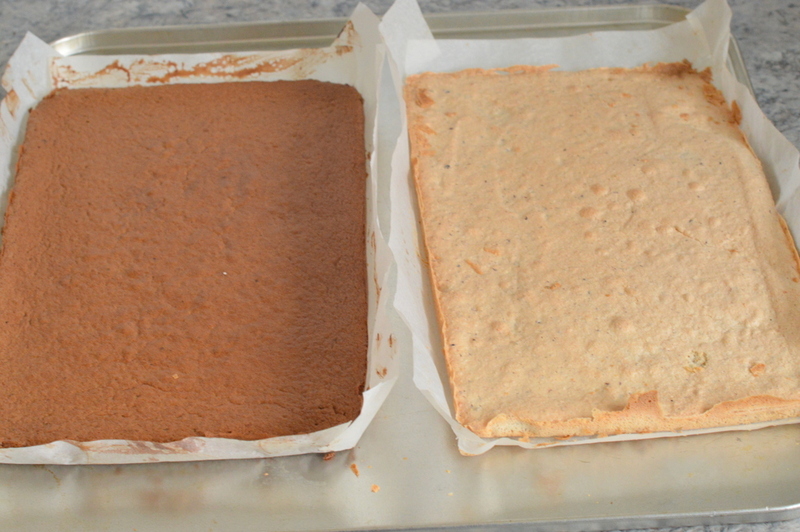 Other than that, to make the sponge, cremeux and glaze are really easy to make. Winter, such a good weather for all the chocolate work but not a pretty time to snap some pictures. Waiting for a sunny day during these cloudy winter has put many task in pause modes. Now almost into summer in Sydney. I miss the heat from summer. This dessert produces 6 pieces. Decoration is up to your imagination. 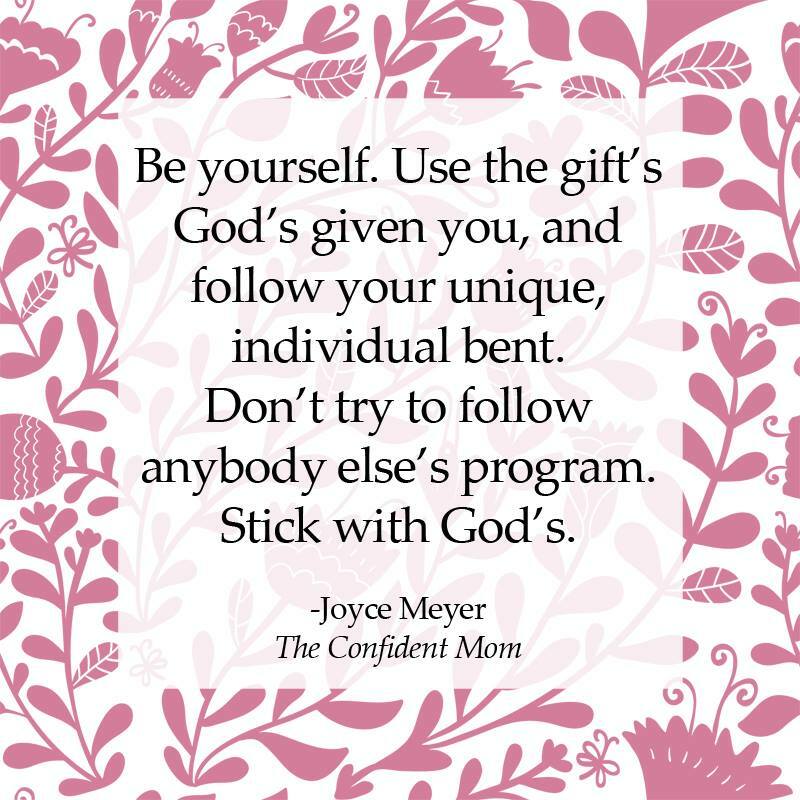 I wanted to learn, so I did. Just wish I have more acetate sheets for me to practice. Let’s get started! Don’t fret over this long process, alright? 2)Bring water and sugar to boil. cool slightly. 3)Pour warm syrup and lemon juice into puree. Mix well.Strain.Leave to cool. Note: Raspberries puree can be stored in airtight container for 2-3 days. 1)Soak gelatin leave sin cold water.Let it soften. Squeeze the water out. Microwave on high heat for 30 seconds until melted. 3)Mix in the melted gelatin into raspberry puree.Stir till dissolved.Strain. 4)Fold in whipping cream.Mix well. Pour into piping bag. 6)Gently fill the prepared acetate tubes,ensure there is no air pockets inside.Secure another ends of tubes with cling film. Allow to set in freezer for at least 2 hours till harden. 1)Preheat oven to 190C, line baking paper on a 26cm X 16.5cm rectangular baking pan. 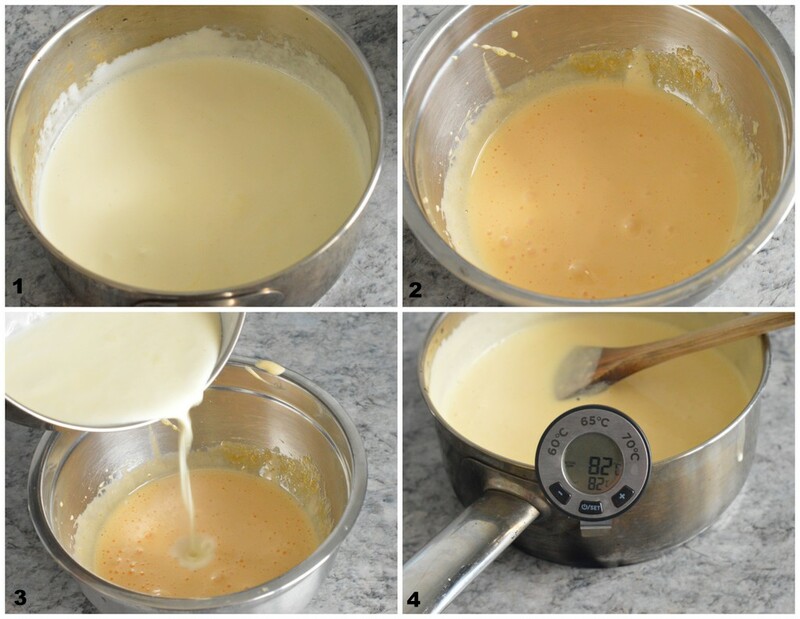 3)Remove from heat, continue whisking eggs mixture to ribbon stage (b)[ picture 2 ], this is also called SABAYON (c). 4)Fold in all the flours using spatula through whisked sabayon mixture from step (3). 5)When flour is 3/4 folded through, scoop out some mixture and add into melted butter. 6)Add butter mixture from step (5) to sabayon mixture until smooth. 7)Pour into prepared pan.Bake for 15 minutes or till sponge springs back when pressed gently.Cool down and trim into 6 pieces of 13cm X 4cm of rectangle. (a)Bain marie ? also known as water bath. Set a bowl over saucepan of simmering water. It is important that the base of the bowl does not touch the water while cooking in the bowl. 1)Preheat oven to 190C and line baking paper on a 26cm X 16.5cm rectangular baking pan. 3)Mix ground hazelnut, flour, icing sugar and ground almonds together. 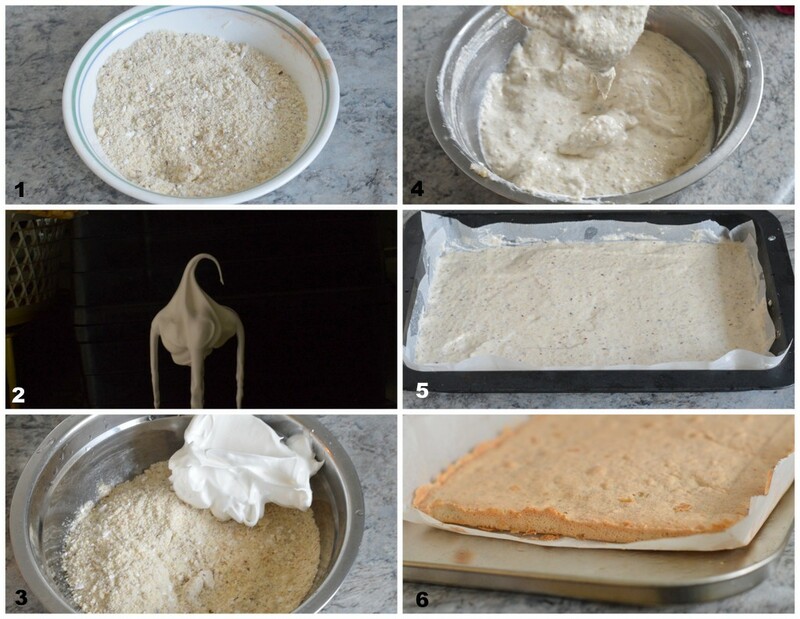 4)Fold in meringue into hazelnut flour in 3 additions until well combined. 5)Spread mixture on prepared pan. Bake for 12-15 minutes. Cool down and trim into 6 pieces of 13cm X 4cm of rectangle. (a)what is meringue? Meringue means egg whites and castor sugar are beaten to airy texture with alot of air pockets trapped inside.Usually to double or tripled of volume. 1)Put chocolate in a bowl. 2)Bring milk, cream and vanilla paste to just boil.Off heat. 3)Beat yolks and sugar til light in colour with hand mixer. 5)Switch off the heat. Strain over chocolate. Mix until smooth. 6)Add in butter, mix till smooth. 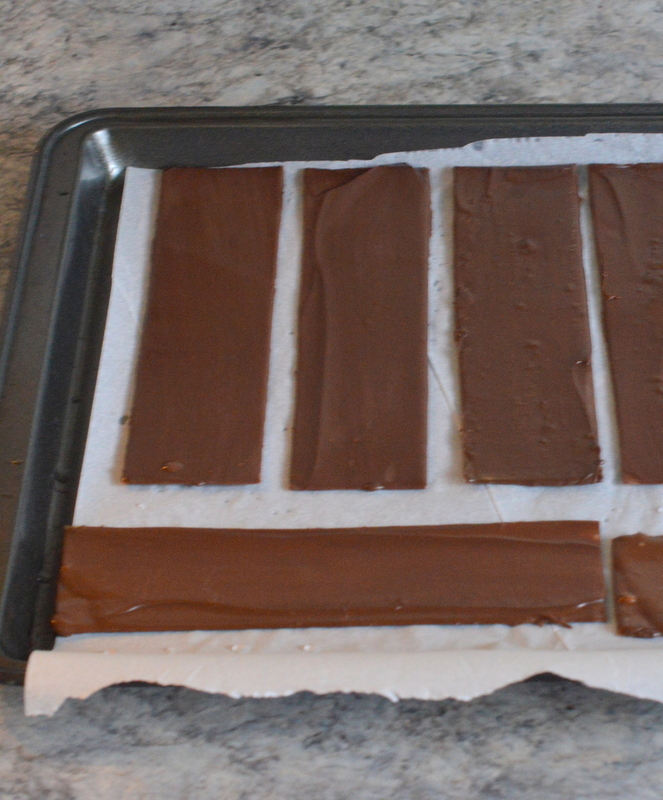 7)Spread into a shallow tray, cover with cling wrap, leave in fridge to semi-set for piping later. 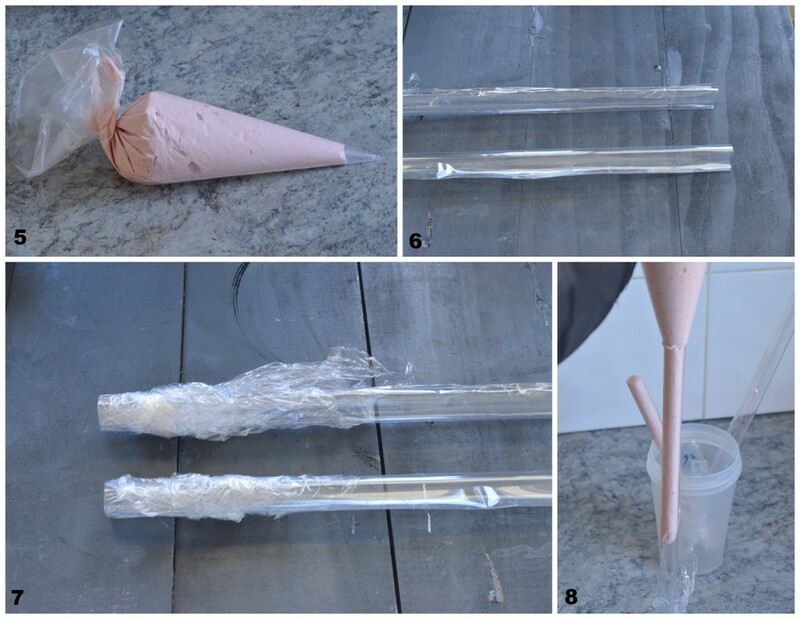 Pour into a piping bag with round nozzle. 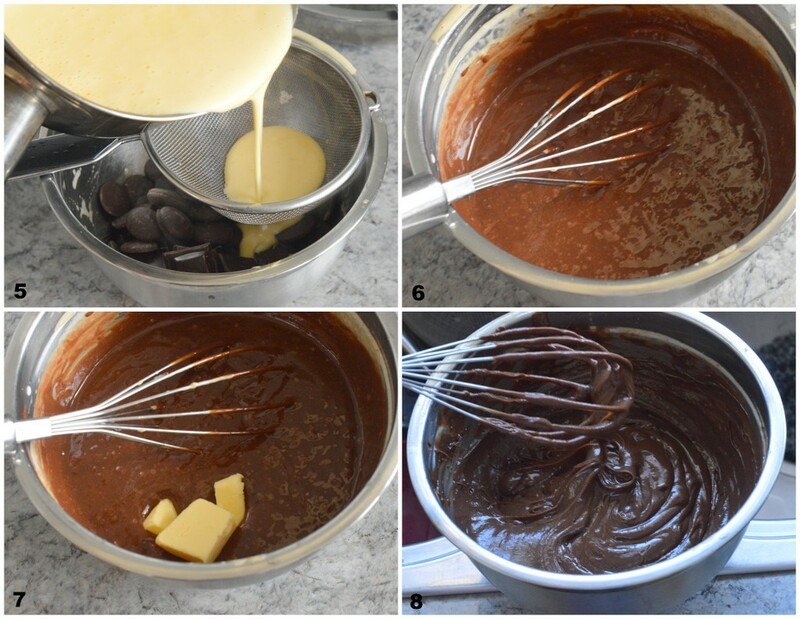 1) Melt chocolate over bain marie/double boiler or microwave every 10 seconds in high heat (keep stirring every time comes out from microwave) till melted smoothly. 2)Spoon few dollop of melted chocolate into acetate sheet. 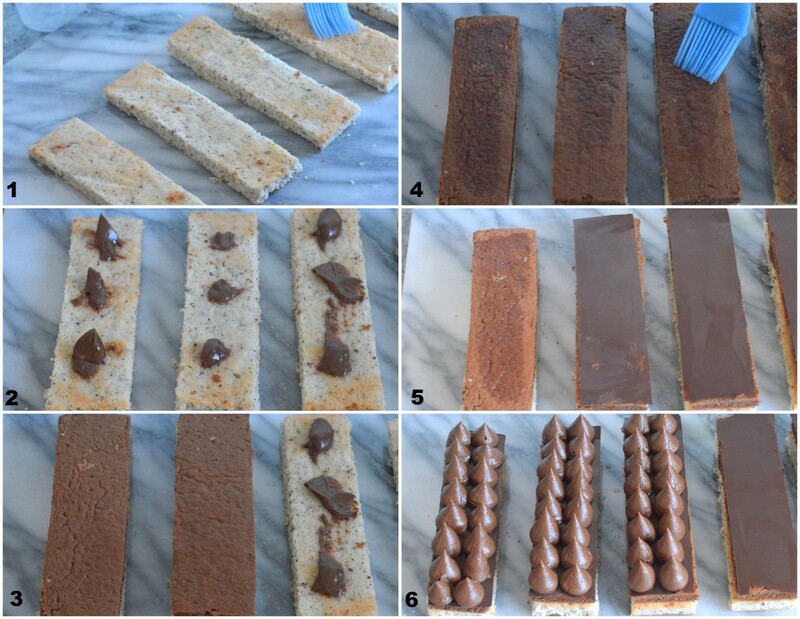 Thinly and gently spread the chocolate over the sheet. Allow to semi-set then transfer into a baking tray. 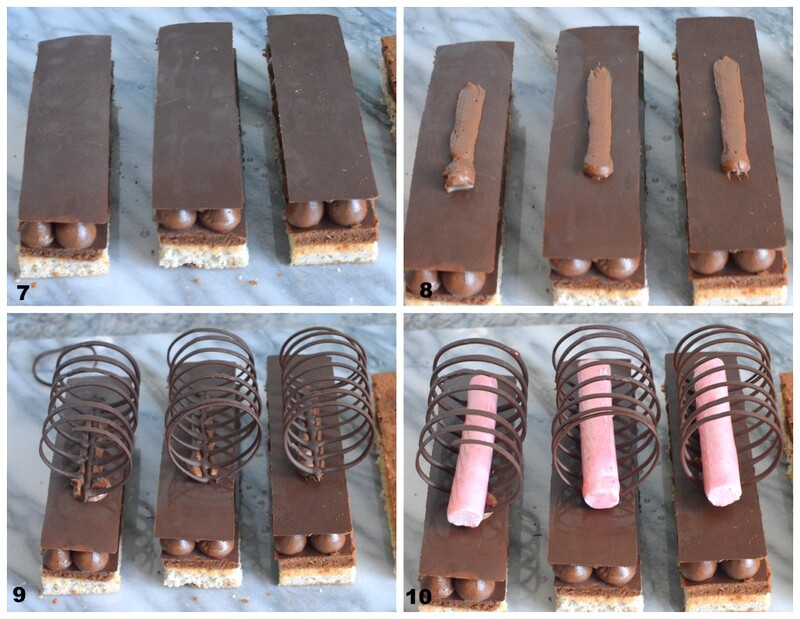 Place a piece of baking paper onto arranged chocolate rectangles followed by another baking tray to keep it flat while it sets in the fridge. Once chocolate has fully set, carefully peel the acetate away from the chocolate. Remember to keep the chocolate in airtight container in the fridge before using it. 1)Mix all into together to well combine. Mix all together til sugar dissolved. 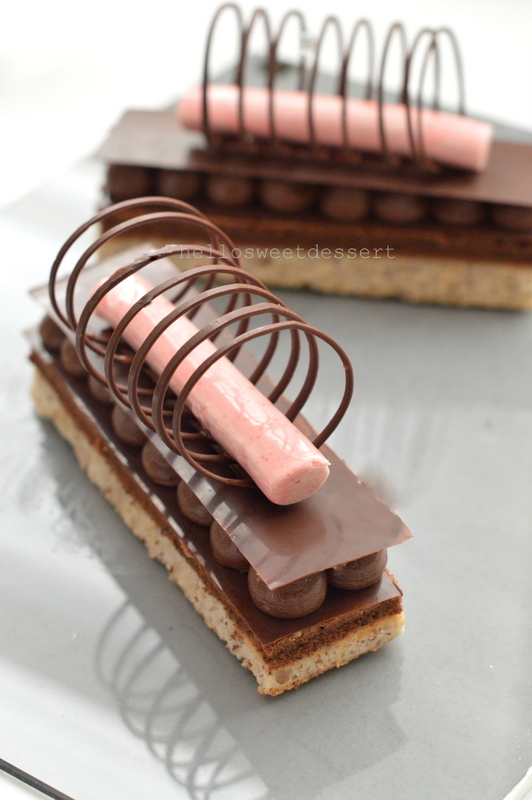 1)Once raspberry mousse is hardened, remove from freezer.Peel off the acetate tubes. 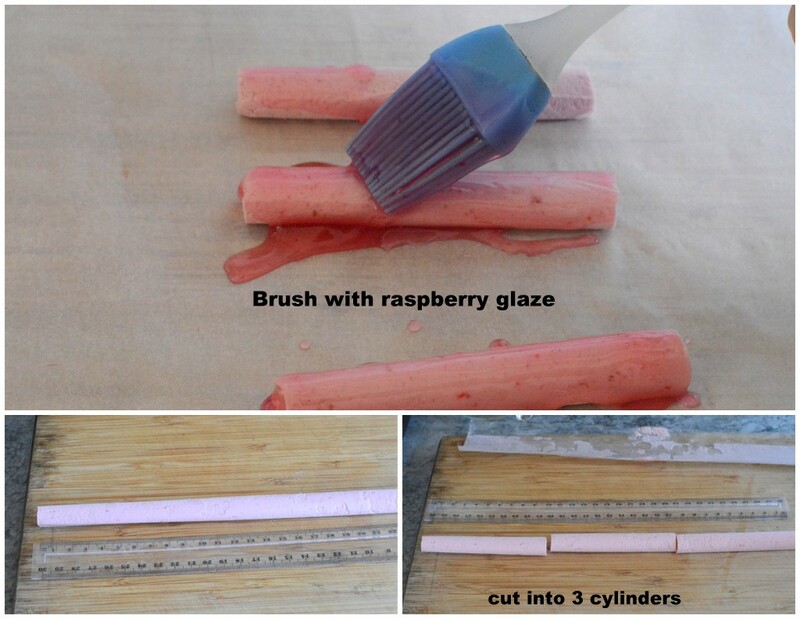 Cut into 6 piece of 10cm long raspberries cylinders. Place back in freezer for few minutes. 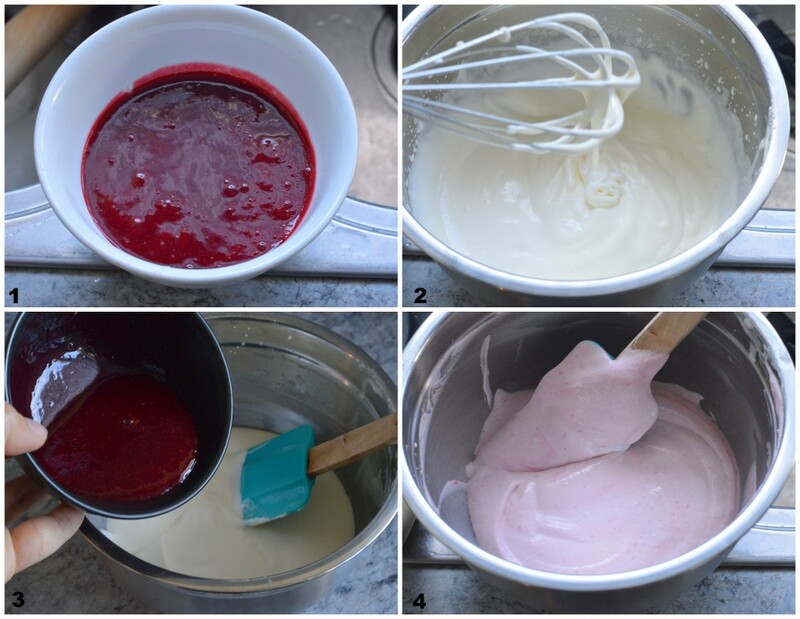 Brush the raspberry glaze onto all the raspberry mousse.Place back in the fridge. 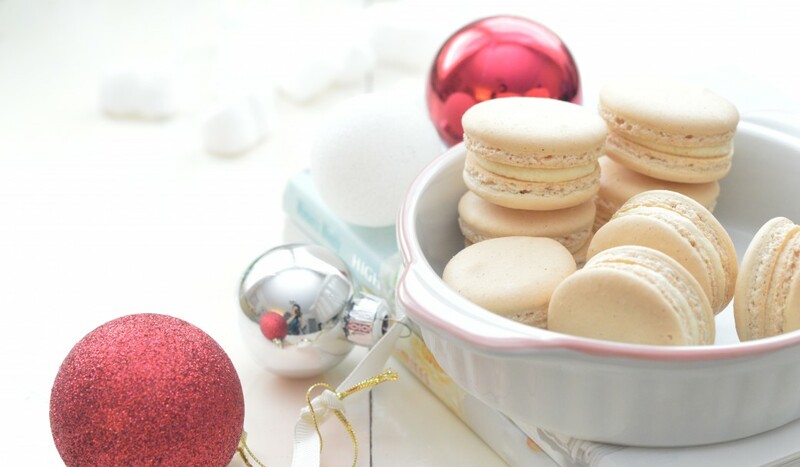 2) Place the cut Hazelnut Biscuit Macaron onto a tray,brush with simple sugar syrup.Pipe 3 small bulbs of Dark Chocolate Cremeux on top of the Hazelnut Biscuit Macaron. 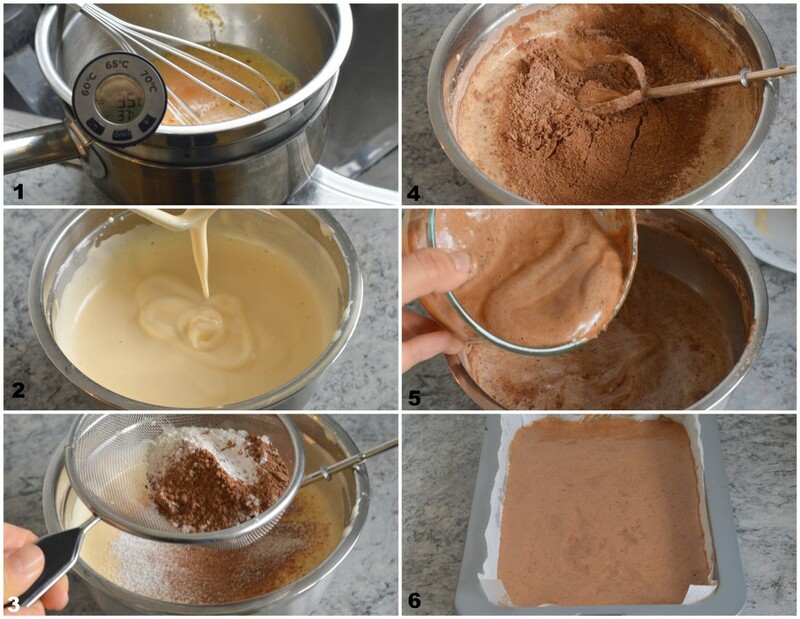 3)Place the piece of Chocolate Sponge on top , then soak the sponge with simple sugar syrup. 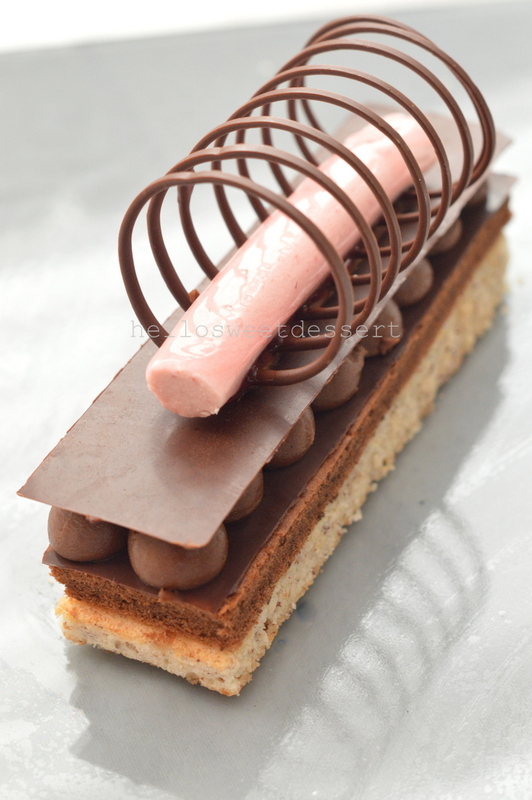 4)Pipe 3 small bulbs of cremeux on top of the Alhambra Sponge and top with one of the prepared chocolate rectangles. 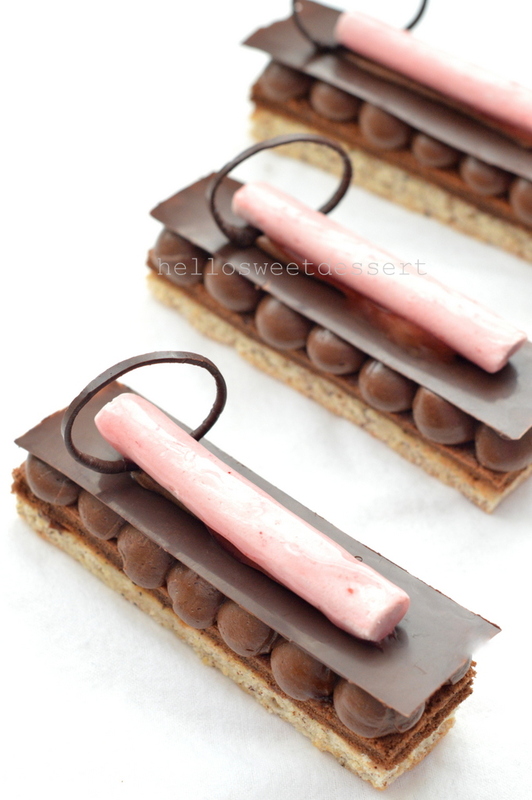 5)Pipe 2 rows of large bulbs of Cremeux along the top of chocolate rectangles.Top with another chocolate rectangle, then place a small line of cremeux in the centre of each chocolate rectangle. 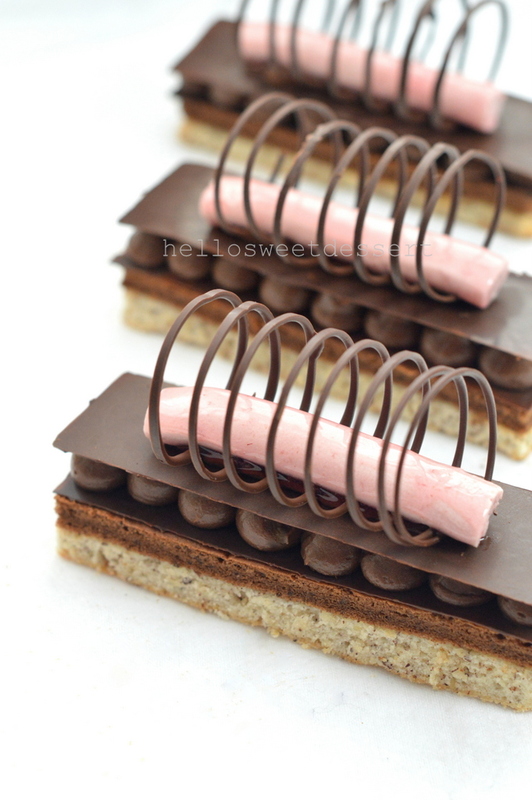 6)Remove raspberry mousse from fridge and use a small palatte knife to place them into the middle of the chocolate.Decorate with prepared chocolate hoops as desired. 7)Place back in fridge for 30 minutes. Serve. (a) This dessert is definitely interesting. I love the dark chocolate cremeux , smooth and silky. 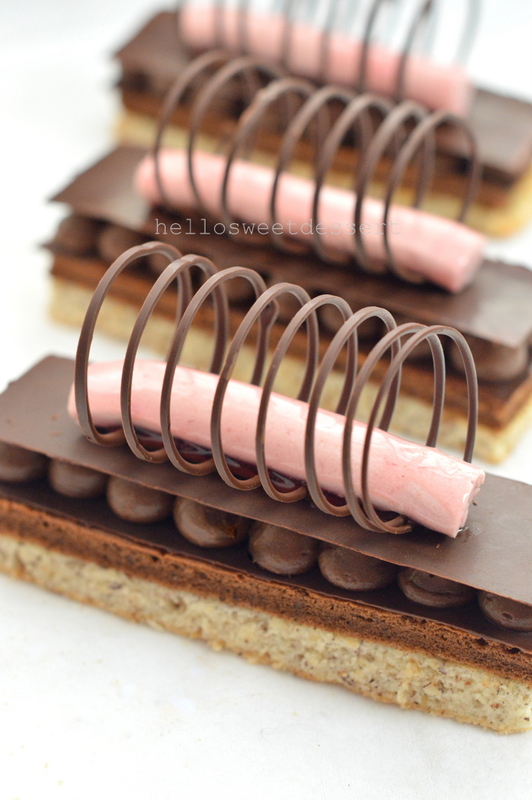 The raspberry mousse is my first try in tubes, goes well with all the chocolate. The sponge and biscuit macaron are not suppose to be super soft, it has a very different dimension in the texture and flavour.Overall, I love it. 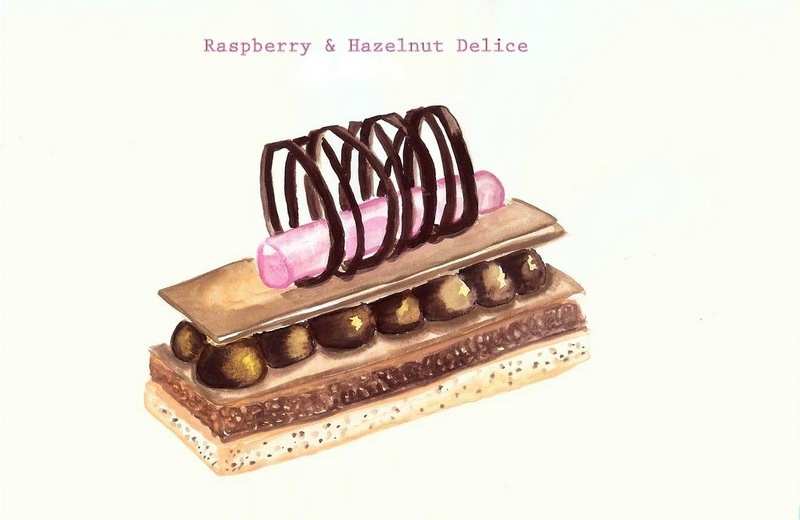 (b)What is chocolate delice?Chocolate Delice is a form of dessert that is made from chocolate and a host of other ingredients like whipped cream, berries and nuts, caramel, eggs, milk and icing sugar. It is a popular dessert in the UK. p/s:If there is any mistake and doubt of my work, do let me know, I will try rectify it.This work has been constructed under taking multiple medications which could cause drowsiness. My deepest apology. I am back for my health update.Just a bit.